 5XNW Archives | What Should We Do Today? I don’t consider myself a lazy person, but the longer I’ve spent in the house, the harder I find it to leave. And it’s certainly not because I’m a homebody or someone who is content just hanging around the house with two small creatures who can exert more energy in a single hour than I exert all month (hmm, maybe I am lazy?). It’s just that, on a day like today, I look outside at the snow falling, and I weigh the work required to get outside and get somewhere…getting everyone into winter coats, hats, gloves, boots, scraping off my car, getting my children into car seats and myself all wet, cold and yet sweaty at the same time. I look at the roads, which are covered in my neighborhood, and I wonder if they’re safe, if my sanity is worth venturing out. Then I look around me, inside the house, and I see how much work it will be to stay home: two boys who haven’t been out of the house in days, either. They’re loud, and chasing each other, and fighting over who had what and who wants what. I’ve already tried TV, but after about 35 minutes, they’ve hopped down off the couch and started half-heartedly watching while they simultaneously get into everything within the viewing area of the television. They’ve been getting up early lately – before 5:30AM the past two mornings – and they’re so tired, they rely on hyper-activity to keep themselves awake. Today, I decided it was just too much work to stay at home. 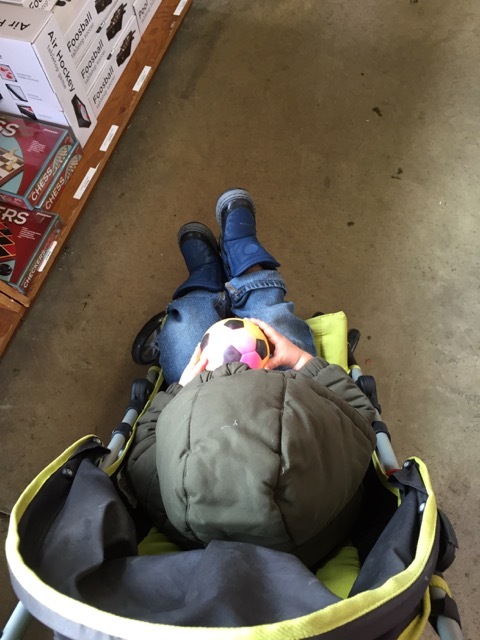 Getting into the car is hard work, but I will say this….it might be work wrestling a 19 month who doesn’t want to sit in his car seat, but once he’s in, once my four year old is in, they get quiet. It’s like this magic spell is cast that automatically calms them and makes them mute. I can’t tell you how many times I’ve gotten into the car having no idea where I am going to go. I just know that if I do the work to get them in there, everything will be okay. Today was one of those days. I got them into their car seats and then I got out to scrape the snow off the windows. When I do that, I always stop after I’ve cleaned their window and peek in at them and wave. They love it! They get these sweet little smiles that make all the curse words I was trying not to say earlier melt away. I got into the driver’s side and looked into the rear view mirror – same sweet smiles and that ever elusive state: silence. 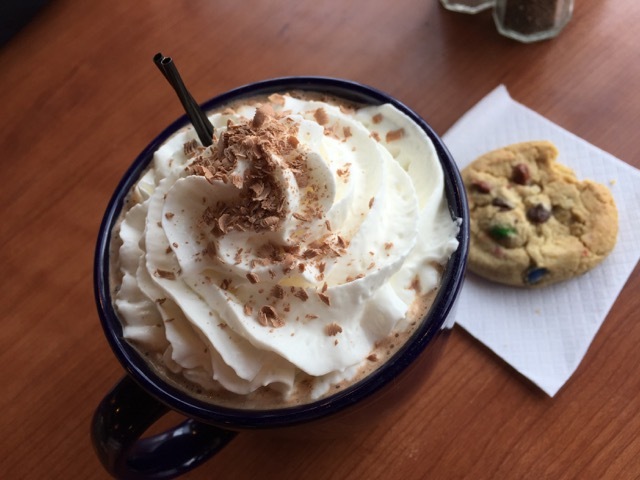 It was then that I decided out loud, “I think we need hot chocolate and cookies!” Well, now the words were out and we all know there was no turning back. We headed to Chocolate Cafe. While we stood looking at all of our choices, the man behind the counter asked how he could help. 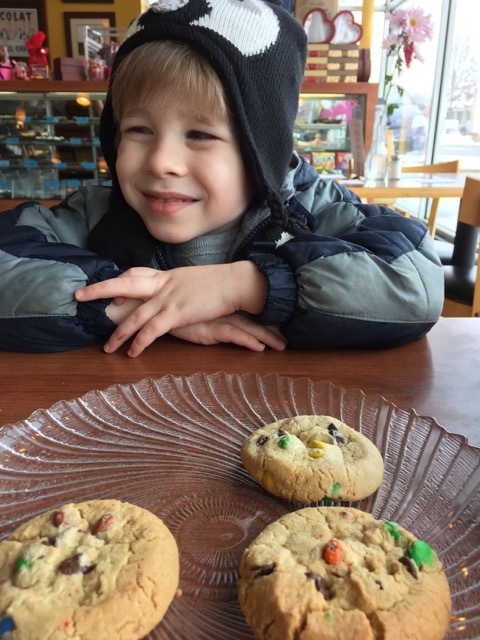 I said, “We need hot chocolate!” And Jaden tugged at me and said, “Tell him we need cookies, too!” So we got one hot chocolate to split between the three of us and a cookie for each. And you know what, we had a good time together! I guess offering kids sweet treats is kind of cheating if you want them to sit still in their seats and eat, but it was just what I needed this morning. It turned what was a difficult morning into something sweet (in more ways than one – but doesn’t chocolate always do that?). 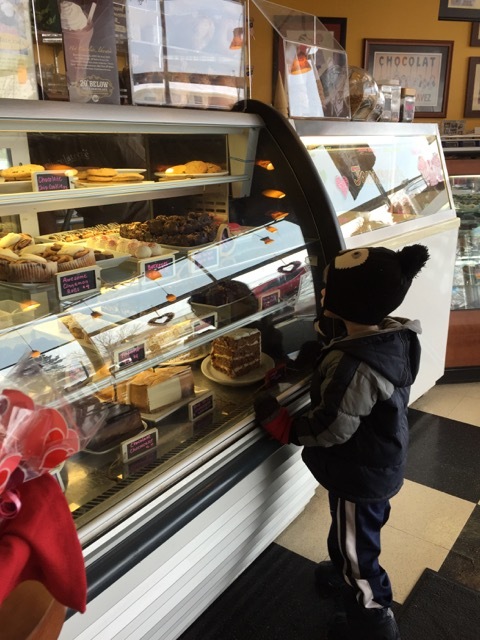 Chocolate cafe is a fun place to take kids. It feels special and exciting to them…being surrounded by so many sweets! 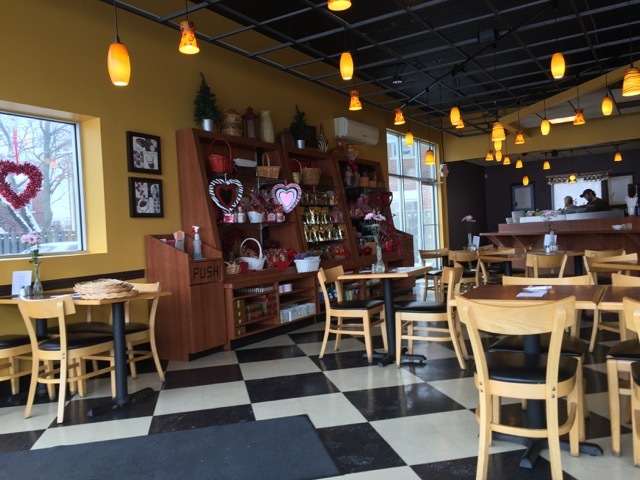 It’s bright and cheery, there’s ample seating (and lots of highchairs), and it’s just really hard not to be happy here. 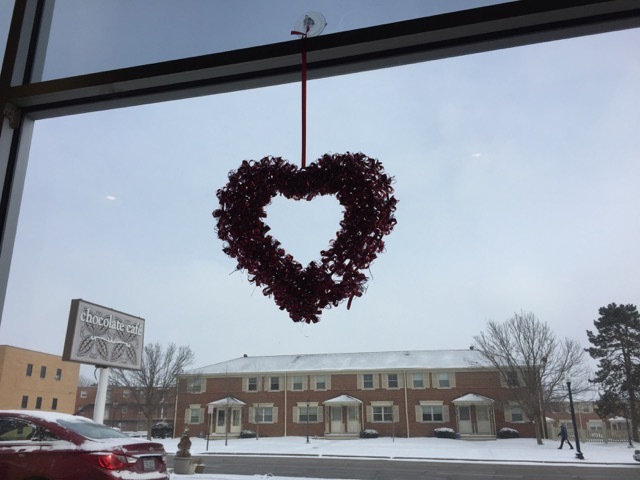 The large windows let us watch the snow from inside and the Valentine’s decorations sparked the idea to make Valentine’s Cards for our friends and family. 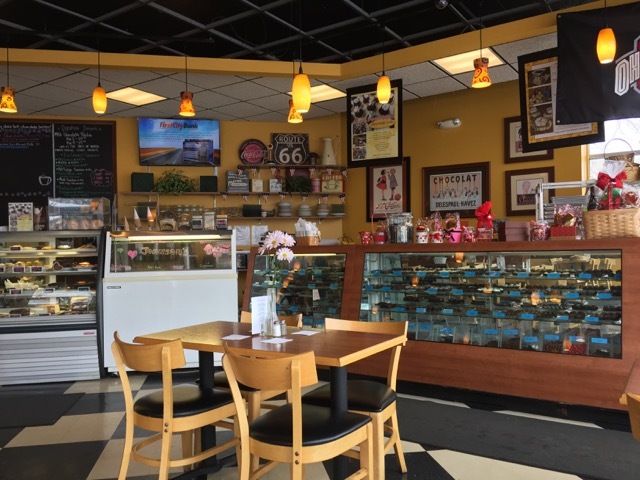 So after our idyllic sweet treats (they do offer lunch and dinner as well, by the way), we headed out to another place I had been meaning to hit for a while: Star Beacon. 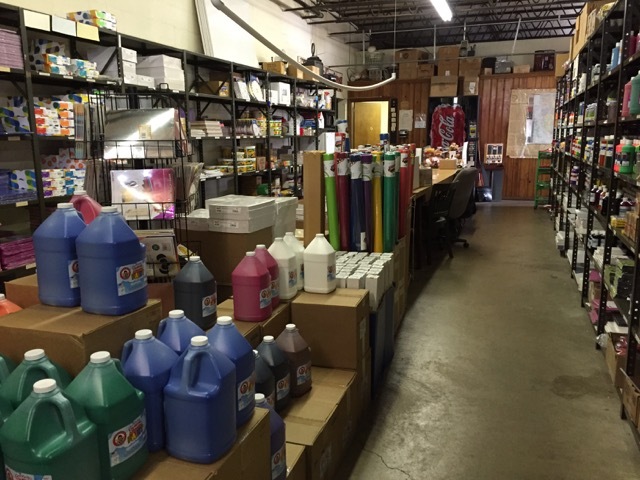 This is a little store chock-full of school supplies and art and craft materials. Teachers and crafters, eat your heart out! There’s so much stuff here at reasonable prices, I have to exercise great restraint. I also have to keep Mayson in the stroller! Way too many small objects at toddler-eye level!! Mayson also threw a fit at the end when I wouldn’t let him keep the rubber ball he had been holding the whole time we walked around. And then he threw a fit at our next stop, Target, when I had to take the heart stickers from him to check out. So yeah, let me not just end with the cute cookie pictures – life continued to go on . . . toddler tantrums continued, tormenting each other continued, but, you know what? We got out of the house. We did it and it was worth it! Parenting is hard, people! 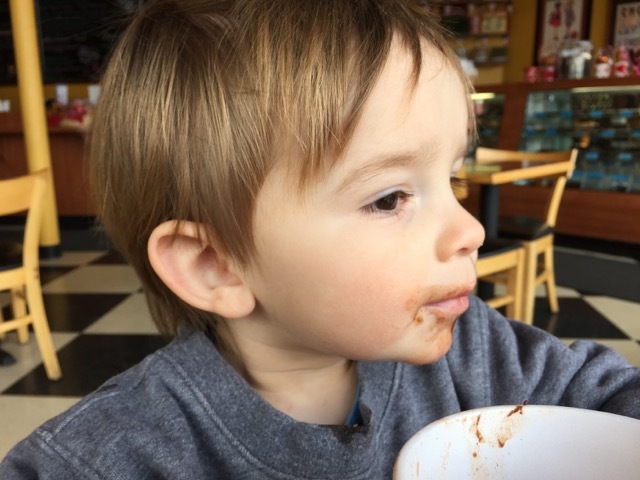 Sometimes you’ve gotta let yourself have your chocolate and eat it, too!